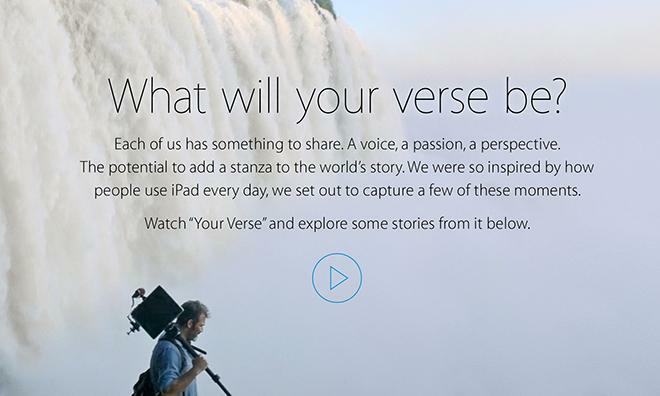 As part of its ongoing "Your Verse" ad campaign, Apple on Wednesday released two short 30-second spots once again focusing on the iPad Air's eclectic capabilities as a tool for professionals and everyday users. As with the full "Your Verse" ad which debuted almost two weeks ago, the latest commercials make use of Robin Williams' monologue from the movie "Dead Poets Society." The ads, titled "Light Verse" and "Sound Verse" are basically remixes of the same scenes from the original spot, which show the iPad Air being used by mountain climbers, deep sea divers, children, and more. Each spot contains the same snippet from Williams' dialogue: "To quote from Whitman, 'You are here —that life exists, and identity; that the powerful play goes on and you may contribute a verse.' What will your verse be?" While not as impactful as the full version with swelling music and sound effects, the 30-second tastes include a bit of unseen footage from each story.